Product Dimensions: 28" back width x 17" total depth. Clears 4 1/2" under crossbar. There is nothing like the glow of a fire in your hearth to add charm and relaxation to your home. 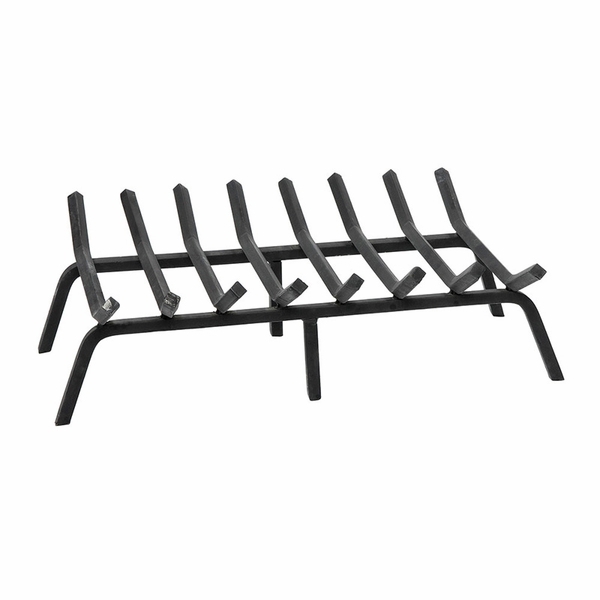 With this 28-inch heavy-duty fireplace grate your fires will burn hotter and more efficiently. The sturdy 3/4" diamond section steel bars are the perfect base for large wood pieces, and with 4 1/2 inches of clearance under the crossbar there is plenty of room for air to circulate. This grate is not tapered, and is 28 inches wide in front and back, and is 17 inches deep. The curved bars provide stability and keep logs in place. What an awesome product. I?m actually very, very happy with it. We?ve had it for two winter seasons where it was used frequently, and it still looks amazing. This grate has exceeded all of our expectations. It's sturdy and well made, and should hold up well and last for years.